About 100 people turned out for a demonstration in support of South African war resisters outside the South African embassy in New York, January 12, 1980. Demonstrations also took place in Chicago and San Francisco. 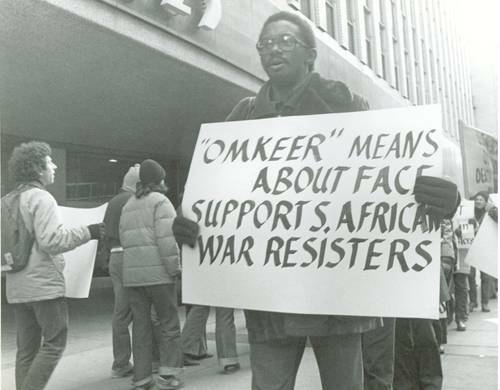 The U.S. actions, organized by SAMRAF (the South African Military Refugee Aid Fund), were called to protest the induction of 25,000 to 30,000 white South African conscripts. Similar actions were also held in London and Amsterdam. At a press conference the day before the demonstration well known peace activist Dave Dellinger called on Americans to support the resistance movement within the South African military, noting the desertion of some 300 South African soldiers. John Collins, the co-director of Clergy and Laity Concerned (CALC) announce that CALC has helped ship "Omkeer" (About Face in Afrikaans), a banned soldiers publication, into South Africa. Don Morton was the staff coordinator of SAMRAF. Photo from the Southern Africa Committee photo archive.